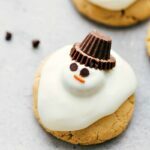 Adorable AND delicious easy-to-make melted snowman cookies. The cookie base is a peanut butter cookie and is topped with peanut butter cups and a white chocolate coating. Line a large baking sheet with parchment paper or a silpat liner and set aside. In a microwave-safe bowl, microwave the butter until it’s about 80% melted. Pour into a large bowl and add in the brown sugar and white sugar. Mix with a large whisk (don’t use hand mixers) until JUST combined. Add in the peanut butter, almond extract, and vanilla extract. Mix until combined. Add in one egg. Mix just until ingredients are incorporated and then add in the last egg. Again mix until the ingredients are just incorporated. Scoop the cookie dough into large balls (see picture in post) and place on cookie sheet. Bake for 8-10 minutes. Ever so slightly under-baking the cookies will keep them soft and chewy. (They also bake a bit more on the cookie sheet when removed from the oven). Be careful to not over-bake these cookies! Remove the cookies and allow them to cool on the baking sheet for 5 minutes before removing them to a cooling rack to finish cooling completely. When the cookies are almost completely cooled, but not all the way, gently press a miniature reese's cup into the center of the cookies. Let the cookies then cool 100% of the way. Once the cookies are completely cooled (you can chill them if you're in a warm kitchen), melt the white chocolate chips in the microwave. Microwave them (don't add anything) in bursts of 20 seconds, stirring in between each burst for 10 seconds until the chocolate is melted and smooth. Using a small spoon, spoon the white chocolate over the miniature reese's cup. Tap the cookie on the counter a few times and then add another spoonful of white chocolate on top if needed. Again, tap the cookie a few time to get the white chocolate to spread and be smooth. Immediately press in the "hat" (see step 14) to the top of the "head" of the snowman and then add two miniature chocolate chips (placed upside down) below the hat and finally one orange sprinkle below the chocolate chip eyes. To make the "hats": use a very sharp serrated knife to cut off the top of a miniature reese's cup. Place some of the melted white chocolate on the bottom of a MINI reese's cup and attach the MINI reese's cup to the cut miniature cup.